As with many projects of this kind, the beginnings of this book can be traced back to a combination of casual e-mails, a conference panel, late night discussions, a colloquium, and the enthusiasm and commitment of a group of dedicated young(ish) academics. In early summer of 2006 I received an e-mail from my colleague Kendrick Oliver at the University of Southampton, asking whether I would be interested in putting together a panel for the 2008 OAH conference in New York City. In proposing the session, we wanted to formulate a response to a challenge issued by Jon Butler in 2004 to address the "religion problem" in modern American history. "Jack-in-the-box" was the colloquialism Butler had used to describe this current shortcoming. What he meant by this was that American historians still tended to treat religion as a historical phenomenon that pops up for a short time, makes some noise, surprises some people, scares others, and then suddenly disappears again into a box where it waits for its next release. 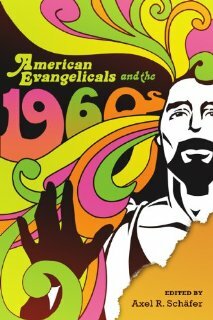 Part of this myopia, we felt, was the notion that resurgent evangelicalism should primarily be understood as a "backlash" against the broader sociocultural and political transformations that emanated from the 1960s. In the course of the following year, Kendrick and I corresponded with a number of the people who eventually became contributors to the volume that is about to be published. Steven Miller joined the panel with a paper, Darren Dochuk as commentator, and Andrew Preston as chair. In the end, we had an American, a Brit, a German, and two Canadians offering a transatlantic perspective on American evangelicals. After the panel, talking late into the night with plenty of libations, it became increasingly clear (though a bit hazy in retrospect) that the papers had all identified the "long" 1960s as a seminal period of fragmentation and realignment for white evangelicalism in the United States--a time when the movement had emancipated itself from prewar fundamentalist militancy but had not yet coalesced into the New Christian Right. Nonetheless, the decade has received remarkably little attention from scholars of the evangelical resurgence. 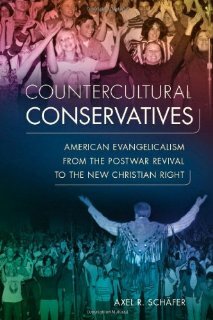 As Darren Dochuk noted in his panel comments, "the singular focus on the post-Reagan Christian Right continues to reinforce Butler’s 'religion problem' in that it tells the story of right-wing evangelicalism in teleological terms as if it was or did nothing of real consequence until 1980." What had thus begun in the metropolitan setting of New York in 2008 continued in 2011 in the North Staffordshire "Potteries" (famous for ceramics brands such as Wedgwood, Spode, and Royal Doulton) when I organized a colloquium on "New Perspectives on American Evangelicalism and the 1960s: Revisiting the 'Backlash'." Funded by the David Bruce Center for American Studies at Keele University in the UK, the colloquium brought together a group of European and North American scholars who in recent years had offered new insights into the origins and meaning of the New Christian Right. With the eminent historian Paul S. Boyer as a brilliant and inspiring keynote speaker, the colloquium participants embarked on a week-long probe into the fraught relationship between the 1960s and conservative Protestantism. First, instead of offering a set-piece arrangement of two sides vilifying each other, the essays show that conservative Protestants not only rejected, but also shaped and transported sixties impulses in unexpected ways. Evangelicalism was intimately connected to key transformations in this polarized period, including in the areas of race and gender relations, youth culture, consumerism, and corporate America. The sixties were a formative period during which the burgeoning religious movement negotiated its relationship with, among other things, desegregation, feminism, deindustrialization, and the expanding welfare state. The decade was thus pivotal not solely because it provided a convenient enemy image, but because evangelicals participated in and were shaped by the very movements and developments they professed to oppose. Second, the essays recover the diversity of evangelicalism by highlighting the fluidity and contingency of its politics. They view the period from the mid-1950s to the mid-1970s not simple as a prelude to the New Christian Right, but as a time when opportunities for rather different political alignments offered themselves. Though the New Christian Right is most prominent in U.S. politics as a result of a tremendous organizational effort and skillful lobbying, radical and liberal evangelicals continue to vie with the conservatives for political influence, and many in the fold are suspicious of economic conservatism and political liberalism alike. Finally, the authors show that the image of the sixties as a catalyst for "backlash" mobilization was an invention of later years when a fully formed Christian Right sought to construct a unifying historical narrative that ignored the internal battles, ideological compromises, political divisions, and sociocultural adaptations that preceded effective rightwing political mobilization. Seen from this angle, the backlash discourse was part and parcel of an effort to proscribe the internal evangelical debate by an ascendant Right. 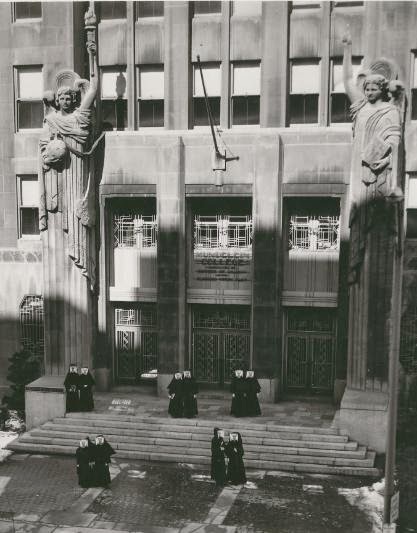 In the same vein, the volume challenges the popular view, embraced by many scholars and conservative activists alike, that resurgent evangelicalism was part of a fundamental political transformation in which moral and cultural issues replaced socioeconomic concerns as the basis for electoral mobilization and partisan allegiance. We all felt very privileged when Paul Boyer, the prolific scholar and leading authority in the field of American cultural, intellectual, and religious history, joined us at the colloquium as the keynote speaker. What we didn’t know at the time was that this was to be one of his last international commitments. While preparing the essays for publication in the Spring of 2012, we heard the sad news that Paul had died. His wit, wisdom, kindness, and scholarly acumen were a tremendous inspiration for our group. Being generous to a fault with advice and insights, Paul even managed to rescue our entirely hopeless cluster of academics from utter ignominy during a very British pub quiz. It is with a deep sense of gratitude to Paul for being a friend and mentor that we decided to dedicate this volume to a wonderful man and a great scholar. I'm really looking forward to getting a copy on the book. I'm working on a related area right now and this should be a big help. Love the cover, too!! Trippy.